One fruit we always have on hand at our house is bananas…monkeys love ’em and so do we. With every trip to the grocery store, I hear the words, “Don’t forget the bananas, Mama!” coming from my little girl’s lips. She can eat them one right after the other. I decided to make some banana muffins last week after I went to see my favorite hair-do girl, Sarah. While she was cutting my hair, we chatted about our usual things…little tidbits of our lives, what was happening on the Bachelor (hmmm, who will he pick?!) and of course, the topic of food. She said that she had just made a loaf of banana bread the day before and that it had turned out quite tasty. Well, after I got home from getting all beautified, all I could think about was making a banana something or other. Eventually, I decided muffins sounded good, so I went to work putting together a recipe and my little banana-loving girl was right there, eager to help with the baking. We were a good team, her and I, since the muffins turned out pretty yummy. I did a mix and match sort of thing…some were filled with delicious chocolaty bits and topped with walnuts, while others were plain with a dollop of some sweet cream cheese frosting. Mix together flour, baking soda and baking powder. In a separate bowl, cream together the sugars and butter and then add the eggs, vanilla, sour cream and bananas. Beat on low speed until everything is combined. Add the wet ingredients to the dry and mix well. Fold in chocolate chips. 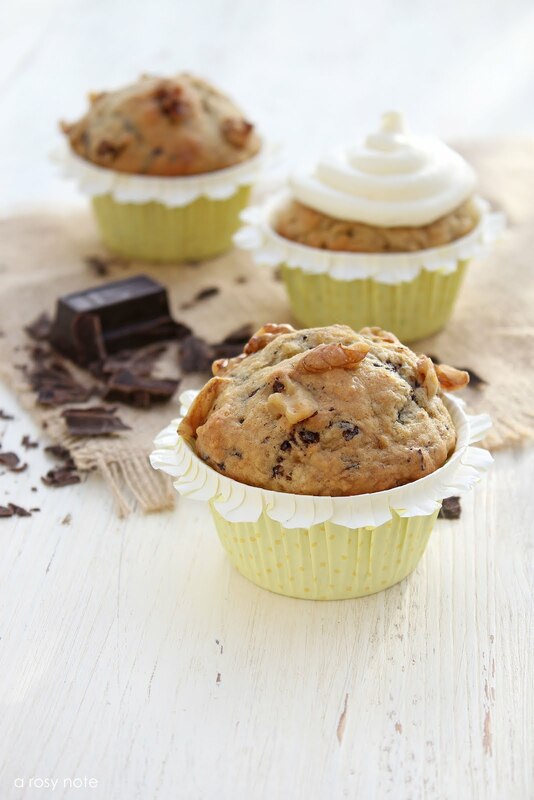 Line muffin pan with paper muffin cups and fill each section 3/4 full with batter. Sprinkle tops with chopped walnuts. Bake at 350 degrees for approximately 18 to 20 minutes. Makes 12 muffins. Oh this sounds/looks SOOO delish!!! Ok, I need to go and bake something…STAT!!! Gorgeous images, of course – and your little girl is too cute!!! My boys love to eat bananas too!!! 🙂 Have a wonderful week, my friend! The muffins look delicious. We love our bananas here too. We have only been recently able to start purchasing them again. We had major flooding here, and the price of bananas skyrocketed. (Very expensive for about 12 months) They are now in great supply and back to their normal price. You always have such tasty and inspiring things to show! I too go straight for the bananas. I have one each night with a bowl of cereal. I have Never eaten a Banana Muffin .. But they Look very delicious..
Ohhh..these muffins look so delicious! I want to give that recipe a try for sure! Your photography always makes everything look so yummy. Those are the cutest cupcake liners. I have to try this receipe, I eat bananas almost every day!! These muffins look delicious, thanks for sharing! Those look so tasty and I just so happen to have some bananas that are ready to go. Love seeing your daughter in the photos:) Of course your shots are lovely as always. Hope you are feeling better. These are my son' s favorite muffins, actually, everything that has bananas…I am still figuring out this love between children and bananas ( you are right, there should be some connection with monkeys , though 🙂 Thank you for this spectacular feast for the senses ! Hugs to the little baker ! Oh my, I don't know if I could choose between the two…both sound and look delicious…I guess I would just have to have both. Sweet and yummy images!! Tricia, I am just in awe of your photographs. So beautiful, each and everyone. I have to ask where you got your wooden measuring spoons. I use mostly wooden or bamboo cooking utensils and would love to have some of the measuring spoons as well. Such a nice visit today. Thanks. Okay, now I'm hungry — your pictures are lovely, and I'll have to try the recipe! art of baking : ) !! I'm a new visitor, I found you on Mona's site and so glad I did! I LOVE your photo's!! WOW, your photo's are GORGEOUS! Thanks for sharing, your muffins look yummy:) And thanks for the inspiration! Oh those looks SO good! I LOVE banana anything. Your pictures are beautiful and your daughter is so sweet, I am so glad that you can share in these moments. I hope you feel better soon, I know how you feel. Those look absolutely scrumptious! Your photos are gorgeous, too! these are awesome! I love the one with the crumbled chocolate. And the last one. beautiful! I have a similar recipe with zucchini also and they've always been a favorite of our daughters. BUT mine don't look anywhere near as cute as yours in those adorable cupcake liners! Yum!! And the little baker in training is pretty darn cute too! Yummy Tricia…can I come over and grab a couple for my snack? I will need to make these over the weekend for my hunny. Where do I find the magazine you were in…La Mia Casa Romantic Country? Yummy! And your styling of the pictures is just as delicious! my little girl loves her bananas too…she is always asking for them at the market! 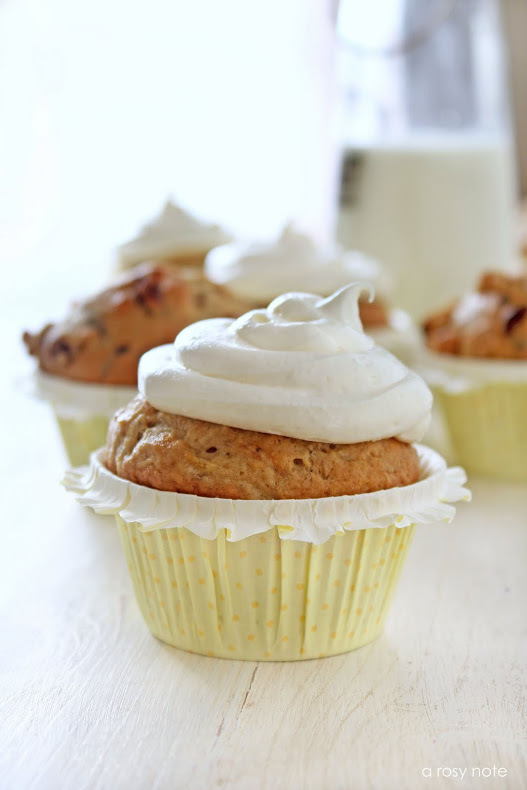 your muffing look soooo yummy…cream cheese frosting on top…amazing!! love all the photos but especially the one with the milk bottle in it ~ so fresh! beautiful images, those look just lovely! 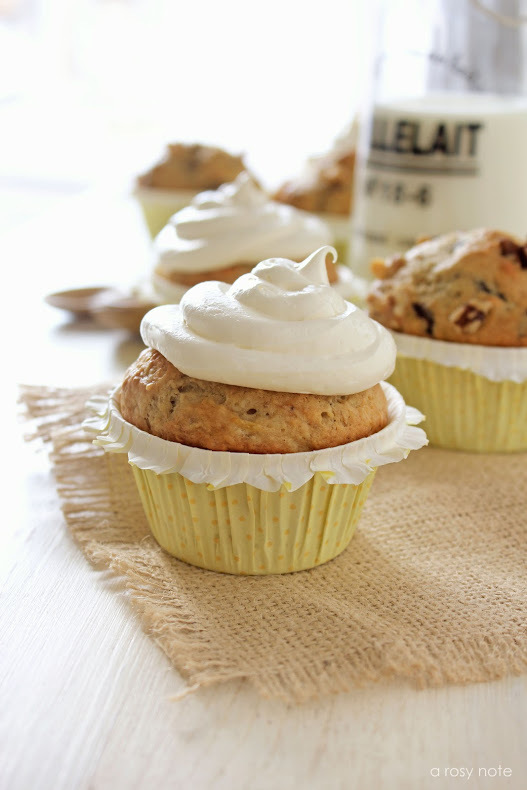 Love your pictures as always, and muffins with a dollop of cream cheese frosting sound divine! Your daughter is a cutie pie! Beautiful photos!!! And those are the cutest muffin liners I have ever seen! My little boy loves bananas but it always seems like I'm throwing a couple of brown ones away. I've been thinking I need to start making banana bread. But banana muffins is a much better idea! I know my family will love these! those look not only super cute…but so delicious! Gorgeous. I adore your photos – you are SO talented! I know what you mean about bananas – I have 2 banana monsters in my house too! We always have bananas in various shades of yellow and brown, lol! Delightful photos. Love all your tools and bowls, your kitchen and beautifully composed photos. Do doubt the banana muffins tasted delightful too. Absolutely beautiful! You have such a sweet helper! 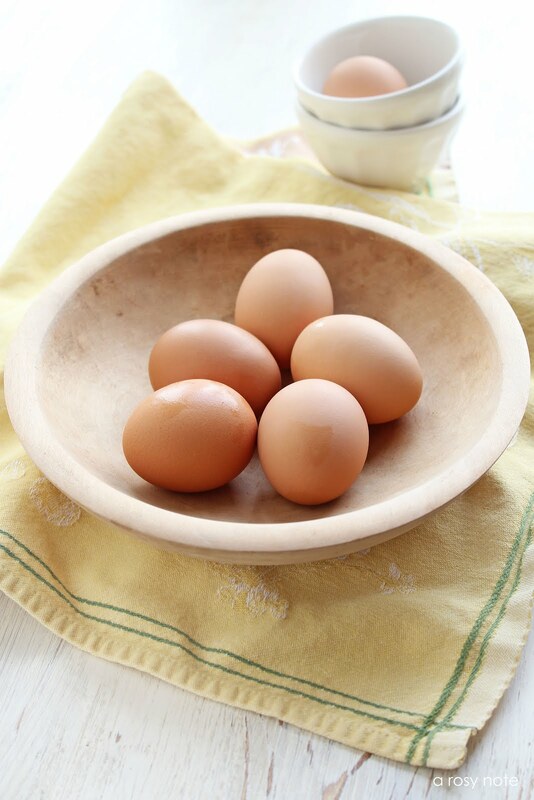 I really love the eggs in the wooden bowl – it all looks so delicious! 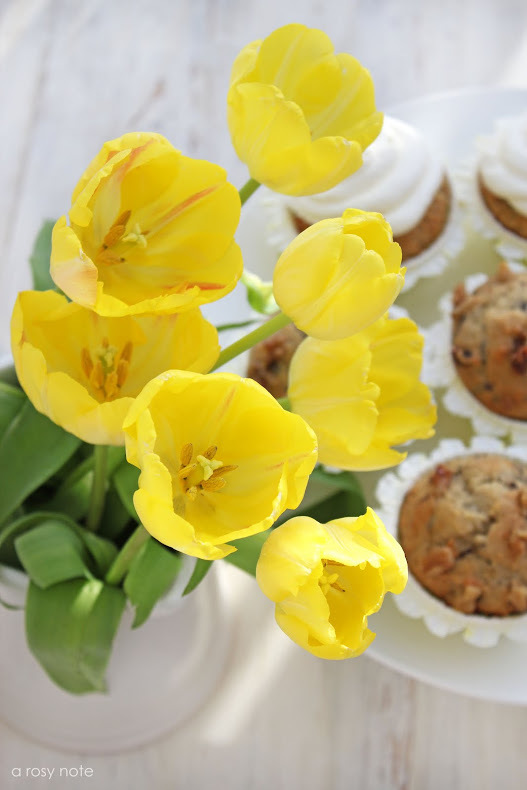 Beautiful photos and so sweet little helper,so delicious muffins..
Yummmm! These remind me a bit of the hummingbird cupcakes I posted about last year. They have banana and pineapple in them and are frosted with cream cheese frosting. Such lovely photos as always and such a cutie pie kitchen assistant! Oh, my, do try those cinnamon rolls I posted…to.die.for. Unfortunately, it was a gloomy, gray day when I made them so the photos aren't the best. These muffins look so delicious, I love yellow and your photos are so beautiful! Love your pictures. Your table and kitchenware look wonderfully rustic, and those muffins, yum! I'll be trying them soon I think, since we have lots of bananas in our house right now. That'll be great way to eat them. I just love your dreamy, yummy photos.. And those muffins look so yummy. Oooops! Looks like I'm too late to the party!Hahaa…The flowers and your daughter are Gorgeous and those muffins look delicious! Awwww how sweet! Your little girl is just adorable and I love her cute little apron. I'm a banana lover too and when my hubby goes to the store (he's the one that loves to go and you better believe I let him lol) I always say 'don't forget the banana's' ! Your photography is so beautiful and as professional as anyone! Enjoy your warm weather up there! Wooohooo! Your banana muffins look delicious! Your photos are fabulous and your little helper is adorable! Tricia they look so good! 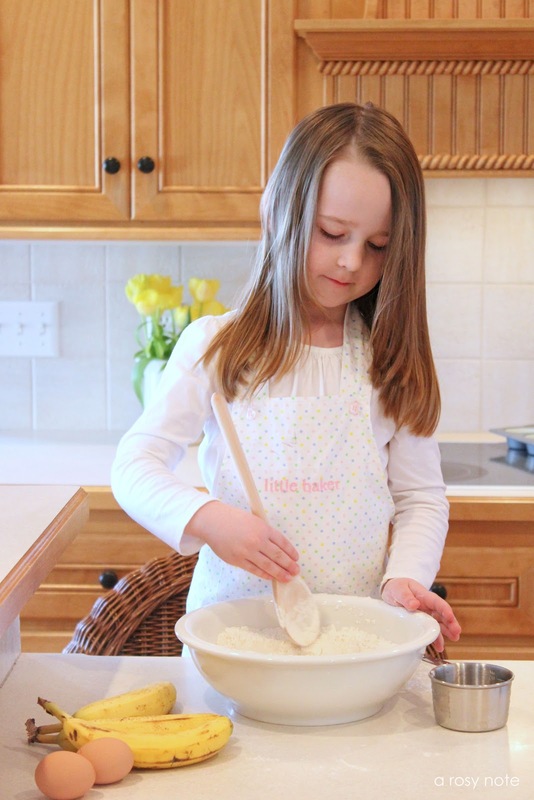 Your "little baker" is adorable and how nuce to have such a sweet little helper! Even the paper around your muffins are sooooooo cute! Hope you are feeling chipper soon my friend! Thanks for the recipe too…we'll have to try it! PS – THANK YOU so much for your sweet note/information note on my post today. I can't wait to do more research about it. I am always looking for something new to do with bananas. These muffins look perfect! These look delicious Tricia! Your muffin cups are adorable! sometimes i do wish we were neighbours; i’d come around to help you… eat! Come and have a peek at my blog if you'd like! Oh I wished Iived near you and I'd want you to give me a call and have me share one of those muffins with you! They look super yummy and your little "helper" is getting so big! Sorry I always have to tell you but I'm still amazed at how beautiful your photography is, just stunning! I always go bananas, too. A fruit we always have at home. I love banana muffins, but my husband and I have been making smoothies almost every day. Yummy. Ohhhhh!!! These look heavenly!! We go 'bananas' over anything with…banana!! I'll definitely be giving these a try!! I love how you can 'taste' the food through your photos!!! oh my your photography is beautiful…as is your daughter! This seems like a great receipe and I will try it! Your muffin papers are pretty cute! We are a banana house, too, Tricia…the muffins look delicious, and your little helper is adorable! Hope you are feeling better soon! wow ….it seems delicious 🙂 and of course the photography is awesome. Photos that make my mouth water!! Wonderful recipe, thanks for sharing it! Dearest sweet tricia, oh my this looks sooo yummieee! I really enjoy your gorgeous happy photos! Your little girl is so beautiful and i adore that milk bottle so much! 🙂 I hope your weekend is off to a wonderful start! Happy merry sunday and love to you! What a beautiful post and series of photographs Tricia! Your daughter has the sweetest little face! So adorable. 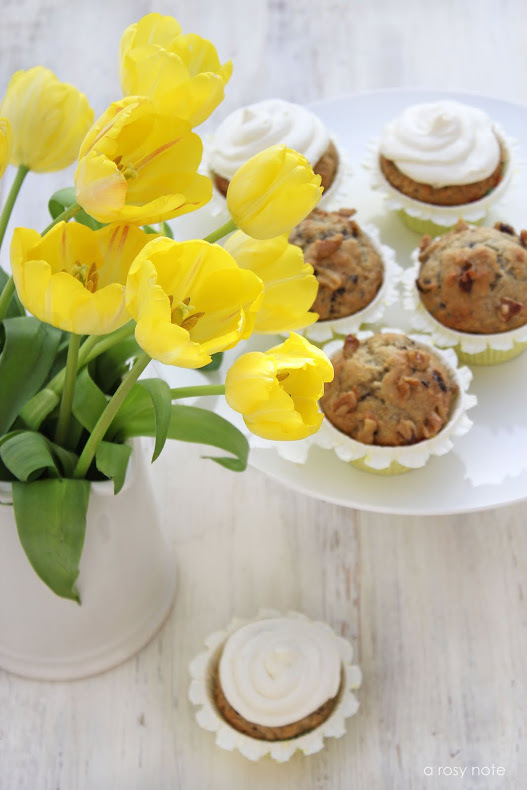 The muffins look delish as well as your photos! love those cupcake liners….where'd you get them? darling! looks delicious….may have to follow suit and make some for for my crew!